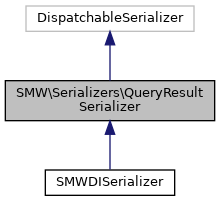 Class for serializing SMWDataItem and SMWQueryResult objects to a context independent object consisting of arrays and associative arrays, which can be fed directly to json_encode, the MediaWiki API, and similar serializers. This class is distinct from SMWSerializer and the SMWExpData object it takes, in that here semantic context is lost. Get the serialization for the provided data item.